Twenty years after the debut of Ford’s front-tire liquefying, Super High Output (SHO) Taurus variant, the Blue Oval is bringing back its street fighting, bulked up everyday hero sedan – albeit this time with twin-turbos, a smattering of modern technology and the reassuring grip of all-wheel drive. While its name might suggest the rather low-tech approach of the past, the fact is this new SHO is far more than a dull Taurus sedan morphed into a straight-line bruiser. Sure, its 365 horsepower twin-turbo V-6 gives it plenty of street cred, but in practice this is a car that isn’t best enjoyed when pushed at ten-tenths or savagely hustled on the edge of control. This is not to say that the SHO’s performance isn’t eye-opening – it most certainly is quick, grippy and entertaining – but at the end of the day what impresses most is its ability to make rapid progress across large chunks of road. And equally impressive is how normal you feel after a long day in the seat. No matter the length of the trip, you will emerge without aches, sore muscles and – thanks to the particularly immodest quantity of techno-wizardry crammed into the cabin – a sense of freeway-zombie boredom. Call it a sign of the times, but the fact that Ford has managed to wrap this drivetrain and superb interior into a package that comes in under $38k makes it that much sweeter. Ford’s turbocharged EcoBoost engine has a torque curve as flat as an ironing board and its entire 350 lb-ft is available at just 1,500 rpm, meaning full-force pull is available just about anywhere in the powerband. 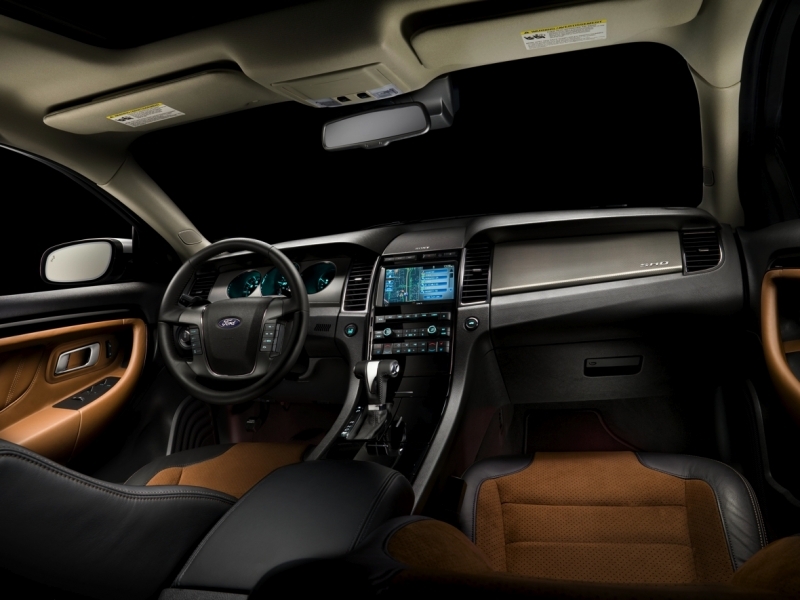 Interior quality has risen leaps and bounds over the previous generation Taurus. Where hard plastics and dull styling cues once lingered you will now find soft-touch materials, plush leather, ice-blue backlighting and one of the industry’s top tech packages. At 20.1 cubic feet, the trunk is utterly cavernous. All-wheel drive is a welcome addition, but at over 4,350 lbs the SHO is a bit of a glutton, as is evidenced by the mediocre fuel economy numbers and slightly sluggish chassis response. The blind spot warning system has a tendency to detect objects on the side of the road, such as trees and posts. 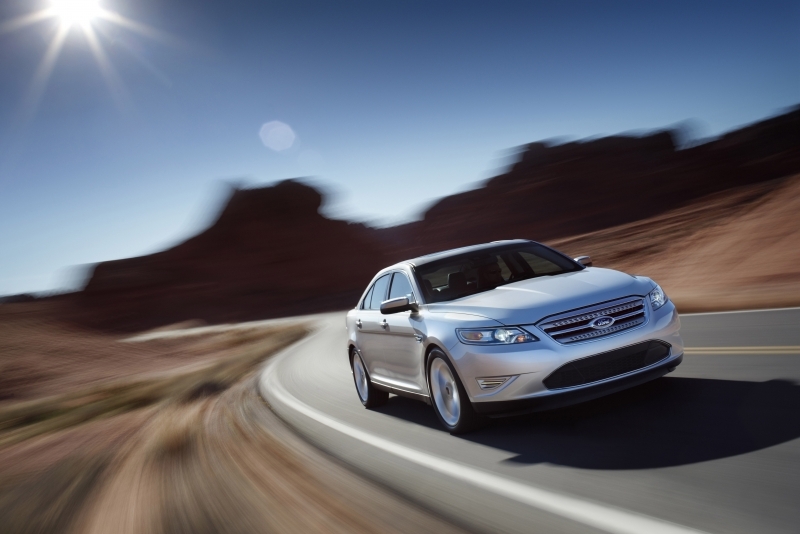 Use of the Taurus name badge may present a perception barrier for some consumers – what was once a humdrum everyday sedan is now Ford’s four-door, luxury- and tech-laden flagship. Throw all of your concerns about turbo lag off a cliff, because the Taurus SHO’s tiny turbochargers render the engine essentially immune to this annoying forced-induction phenomenon. With full torque available at just 1,500 rpm, the engine has Gumby-like flexibility, delivering impressive power throughout the rev range but never feeling as truly rampant as a similarly powerful V-8. The all-wheel drive system is positively surefooted and the lack of a limited-slip differential at either axle is unnoticeable, even on grimy, rain-soaked surfaces. The steering rack has been tightened up for improved response and front-end bite is adequate, though the mass of the car means it isn’t overly-keen on changing direction rapidly and the brake pedal could benefit from improved feel. Paddle shifters located on the steering column click back for upshifts and forward for rev-matched downshifts, but we would prefer the more traditional left for down, right for up mechanism. Strangely, gears cannot be manually changed on the console shifter. Early on in its development, Ford’s new twin-turbocharged EcoBoost engine was given the task of delivering V-8 power, albeit on the diet of a common V-6. With an output of 365 horsepower and 350 lb-ft of torque, the new boosted 3.5-liter six-cylinder mill definitely hits the mark in the ballistics department. A six-speed automatic gearbox delivers power to all four wheels. Want maximum performance? The SHO Performance Package offers a shorter 3.16:1 final drive ratio for improved acceleration, grippy 20-inch wheels, recalibrated steering, a sport mode for the stability control system and upgraded brake pads. Ford is introducing a new technology called MyKey, a Big Brother type system that lets owners assign permissions to specific keys, allowing them to limit maximum speed, maximum stereo volume and traction control settings. Even without the navigation system, getting around is easy thanks to the addition of traffic and turn-by-turn directions from Ford’s SYNC system. The Taurus is equipped with a personal safety system that checks front occupant weight, seating position and seatbelt usage and tension to optimize air bag deployment. New to Ford’s arsenal are radar systems that run not only adaptive cruise control, but also a collision warning system and Blind Spot Information System (BLIS). Collision warning senses an impeding collision and provides drivers with both an audible and visual warning, while brake support pre-charges the brakes for increased stopping power. BLIS not only illuminates the standard side-mirror light when a vehicle is detected in the car’s blind spot, but also displays warning text in the message center. 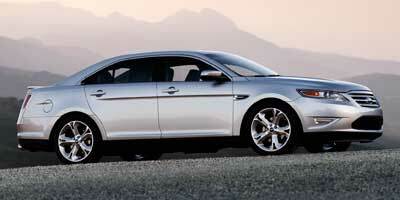 The SHO manages to return the same fuel economy as the naturally aspirated all-wheel drive Taurus sedan. Sounds great, but the truth is the standard AWD Taurus is no frugal sipper, and at 17 mpg city and 25 mpg highway the SHO maintains a steadfast addiction to fossil fuels. The car uses Ford’s new capless Easy Fuel system (basically a spring-loaded flap), which helps reduce the amount of fuel vapor escaping into the open atmosphere. The SHO gets a few improvements over the everyday Taurus inside, most notably the sticky Miko Suede inserts for the soft, 10-way adjustable leather front seats. The dash is notched to create an overhang where it meets with the gauges and glove box, a stylistic cue that we think will split opinions. This is slightly more obvious in the SHO than in the standard car due to the SHO’s aluminum-trimmed console and instrument panels. The Taurus has finally bid adieu to the boring lines of yesteryear. In their place is a modern and sporty exterior that won’t blend into the background of contemporary automobilia. SHO-specific livery includes 19-inch wheels (20 inchers are optional), a subtle rear spoiler and twin exhaust tips. It’s a sleeper if we’ve ever seen one. 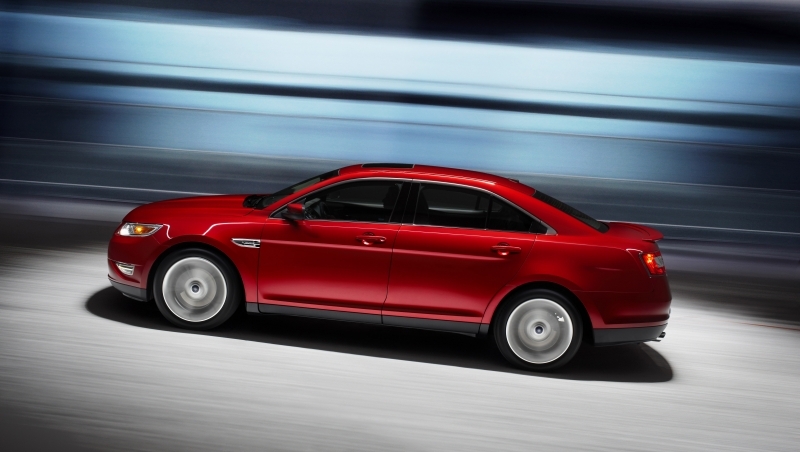 The Taurus SHO slides in under the $40k mark with an MSRP of $37,995. That puts it in somewhat of a no man’s land, but a few cars that are potential competitors include the $37,610 Pontiac G8 GXP, $38,505 Acura TL SH-AWD, $38,700 Volkswagen CC VR6 and $38,970 Dodge Charger SRT8. The $31,555 Pontiac G8 GT sports similar power figures for a less steep buy-in price. While some might look at the 2010 SHO as a rerelease, we prefer to look at it as a clean-slate reinvention. Interior quality and luxury are now perceived as a core focus of the car rather than a nascent afterthought, and while it might not be an all-out, tire-shredding screamer, it has more than enough performance built-in to hold its own in an increasingly capable segment.